In celebration of National Poetry Month, The Writer's Center is spotlighting the work of Poet Lore contributors. 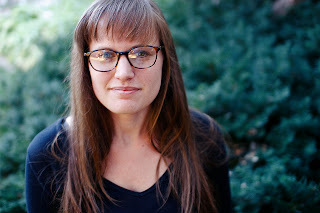 This installment includes a brief Q&A with poet Lindsay Tigue about her poem, “We Are a System of Ghosts” (Poet Lore Volume 111, No. 1/2). is what a man says in a documentary about his city. and we laughed through downtown like girls. the restaurant’s awning threw its door frame in shadow. My mother protested: but these streets are a grid. the countryside dotted with armored cloches of alloyed steel. she watches as I wait for the bus, my eyes shut tight to the wind. Specific as well as vaguer details are interspersed throughout the poem. How do these formal choices affect the reading of the poem, in your opinion? Lindsay Tigue: What a wonderful reading of this poem! Thank you. In the first line, I chose not to give specifics about the man or city because I wanted to highlight the ways his observation applies beyond the history and context of one particular place. The man is anonymous in the same way cities and infrastructure can make their inhabitants feel anonymous, or in the ways they might truly become anonymous. Later details are more specific to show my own windows (whether by experience or information I've learned) into this feeling that my life and memories—as well as others' lives and memories—are impossible to fix in place or untangle from such constructions. Lindsay Tigue won the Iowa Poetry Prize for her first book, System of Ghosts (University of Iowa Press, 2016) and her work appears in Prairie Schooner, Indiana Review, Hayden’s Ferry Review, and elsewhere. She is currently a PhD student in creative writing at the University of Georgia.